A hand-held writing device is provided that includes a writing implement, such as a pen, pencil, stylus, or marker, and a deformable grip that envelops a section of the barrel of the writing implement. The deformable grip forms an air gap between the grip and the barrel of the writing implement. The deformable grip includes a viscoelastic polymer that does not spontaneously deform at room temperature and that, when deformed, recovers its initial shape at room temperature in 5 seconds or greater. Also provided is a method of making the same. This application relates to a deformable grip for hand-held objects and is particularly useful as a gripping member for a writing device. Background The feel of the grip is one of the most important features for users of writing devices. To make the grip more desirable for users of writing devices, it is common to include a layer of an elastic material, such as rubber or silicone, in the grip area of a pen for comfort. These elastic materials can allow for small deformations of the grip from finger pressure when the writing device is held. However, some users of writing devices may prefer a grip that conforms much more to their fingers, thus essentially customizing the grip to the user. It is difficult to use a single material to effectively make a highly deformable grip. Typical rubbery materials, such as those commonly used for grips (i.e. Young's modulus of 0.5 megaPascals (MPa) to 100 MPa), do not allow for high deformations because the force exerted by the user's fingers can be insufficient to sufficiently compress the material. If a softer material is used (i.e. Young's modulus of 0.01 MPa to 0.5 MPa), the material can begin to adhere to the user's fingers, particularly after a prolonged period of writing since the Dahlquist criterion (the modulus below which tackiness can occur) at 1 Hz is 0.1 MPa. Grips have been made from bonding two different types of polymeric materials— one that is soft or flexible and the other that is more rigid. Some grips have been made that can be custom fit to the writing device by, for example, using a material having a softening temperature above human body temperature, heating the material to soften it, mounting the grip on the barrel of the writing device, and then cooling the grip to harden it. Other grips have been made that can be formed to the writer's hand grip using a shape-memory resin. However, some users of writing devices may prefer a grip that conforms much more to their fingers than those currently in the art. For example, writing precision of the writing device user can be affected by the fit of the grip. With a very easily deformable material, the grip can deform during writing strokes. If the grip moves during writing stroke rather than the pen tip moving, the mark from the pen will be incorrect. Therefore, it would be desirable to have a conformable grip that does not move significantly on the timescale of a writing stroke. Furthermore, for economic reasons, it would be desirable to use a single polymeric material to form conformable grips rather than using two or more materials with different properties. In one aspect, a hand-held writing device is provided that includes a writing implement comprising a barrel and a deformable grip that surrounds at least a portion of the barrel thereby forming an air gap between the grip and the barrel of the writing implement, wherein the deformable grip comprises a viscoelastic polymer that does not spontaneously deform at room temperature, and wherein the viscoelastic polymer, when deformed, recovers its initial shape at room temperature in from about 5 seconds to about 5 minutes. The writing implement can be selected from a pen, a pencil, a stylus, and a marker. The air gap between the grip and the recessed section of the barrel of the writing device can be from about 0.2 mm to about 2.0 mm. The viscoelastic polymer can have a tensile storage modulus, E', of greater than 4 megaPascals (MPa) at 30°C when measured at 0.1 Hz and a tan δ (Ε'ΥΕ') of greater than 0.3 measured at 30°C when measured at 0.1 Hz. The viscoelastic material at 30°C can have a storage modulus at 10 Hz that is at least 50% greater than its storage modulus at 0.1 Hz. The deformable grip can have a thickness of from 0.05 mm to about 4.00 mm and can include a thermoplastic polyurethane, an acrylic polymer that includes the polymerization product of isobornyl acrylate and isooctyl acrylate, the ring-opening metathesis polymerization product of dicyclopentadiene and 5-hexyl-2-norbornene, or combinations thereof. 5 minutes. The provided method can further include removing the deformable grip from the barrel of the writing implement and, optionally, replacing the deformable grip on the writing implement. The provided hand-held writing device conforms to the fingers of the user by providing a deformable grip that includes a viscoelastic polymer that does not spontaneously deform at room temperature and when deformed, fully recovers its initial shape at room temperature in 5 seconds to 5 minutes. The deformable grip can deform easily when being held by the user. However, the deformable grip does not typically significantly deform on the timescale of writing strokes. Additionally, the provided hand-held writing device can use a single polymeric material and an air gap to form conformable grips rather than using two or more materials with different properties. The above summary is not intended to describe each disclosed embodiment of every implementation of the present invention. The brief description of the drawings and the detailed description which follows more particularly exemplify illustrative embodiments. Fig. 1 is a perspective view of an embodiment of a provided hand-held writing device. Figs. 2A-2C are cross-sectional views of three different embodiments of provided handheld writing devices. Fig. 3A is a side view of an embodiment of a provided hand-held writing device. Figs. 3B and 3C are side views of the embodiment of the provided hand-held shown in Fig. 3A that has been deformed in two different ways. Figs. 4A and 4B are graphs of Young's modulus (E' vs Temp (°C)) of different deformable grips useful in embodiments of provided hand-held writing devices. In the following description, reference is made to the accompanying set of drawings that form a part of the description hereof and in which are shown by way of illustration several specific embodiments. It is to be understood that other embodiments are contemplated and may be made without departing from the scope or spirit of the present invention. The following detailed description, therefore, is not to be taken in a limiting sense. The provided hand-held writing device and method of making the same includes a writing implement that includes a barrel and a deformable grip that surrounds at least a portion of the barrel of the writing implement thereby forming an air gap between the grip and the barrel of the writing implement. In some embodiments, the writing implement can be a pen, a pencil, a stylus, a marker, or any hand-held writing implement. In some embodiments, the hand-held writing implement can be used to make written or graphic marks with pigment or graphite on substrates such as paper, wood, cardboard, etc. In other embodiments the hand-held writing implement can include capillary-action dip pens, fountain pens, ball-point pens, or disposable pens. Exemplary pencils include mechanical pencils, colored pencils, or graphite pencils. In some embodiments, the writing implement can include brushes, such as paint brushes. Examples of a useful stylus include writing implements that can incise a flat surface, deliver an etchant, or otherwise engrave a surface. The use of wax crayons and chalk or chalk holders as writing implements is within the scope of this disclosure. In other embodiments, the handheld writing implement includes a device that can be used to produce an electronic signal that sequentially produces an electronic image on, for example, an electronic display. In this case, the writing implement can be active, that is it can include electronic components that are, for example, electrically conductive or magnetic or the writing implement can be used to interact, for example by touch, with an electronic device having a touch screen. Alternatively, the writing implement can be inactive, for example it can provide pressure into a pressure-sensitive substrate to create an electronic signal. The provided hand-held writing device and method of making the same includes a writing implement that includes a barrel and a deformable grip that surrounds at least a portion of the barrel of the writing implement thereby forming an air gap between the grip and the recessed section of the barrel of the writing implement. Because of the air-filled gap, the grip can deform by displacing the air in the air-filled gap. Because of the air-filled gap, the resistance force felt by the grip is primarily due to bending of the grip material rather than compression of the grip material. Because the deformation is a bending deformation, a material with a relatively high modulus (Young's modulus of greater than 0.5 MPa) can provide easy deformation while not being tacky. The provided hand-held writing implement includes a barrel. The barrel of the hand-held writing implement includes an elongated part of the writing device and is, typically, the part of the writing implement that is held. The barrel can have any shape of cross-section that can be held. For example, the barrel can be cylindrical and can include a cross-section that is circular. Alternatively, the barrel can have a cross-section that is round but not symmetrically circular, for example, ellipsoid, ovoid (in the shape of an oval), or any regular or irregular closed curve. The cross-section can also include a flat side and be, for example semi-circular, semi-elliptical, or semi-ovoid. In some embodiments, the barrel can have a cross-section that is in the shape of a regular or irregular polygon. For example, the cross-section can be triangular, square, or in the shape of any polygon— regular or irregular. It is within the scope of this disclosure that the cross- section can have elements of curves and polygons designed for easy holding of the hand-held writing device. The barrel of the handheld writing implement can have different diameters or shapes along its length. The barrel of the provided writing implement can include at least one recessed section of the barrel along the length of the writing implement. Typically, the recessed section is a part of the barrel that has a significantly smaller diameter than most of the rest of the barrel. The sides of the recessed section can transition suddenly from the diameter of the barrel to the diameter of the recessed section. Alternatively, the recessed section can taper from the diameter of the barrel to the diameter of the recessed section. A typical embodiment of a recessed section is shown in the description of the figures below and the figures themselves. The provided hand-held writing device includes a deformable grip that envelops at least a portion of the barrel of the writing implement so that an air-gap is formed between the deformable grip and the barrel of the writing implement. The air gap between the grip and the barrel of the writing implement can be from about 0.2 mm to about 2.0 mm. The deformable grip can form a temporary seal that entraps air and forms an air gap in the space it has created when surrounding the barrel of the writing implement. The deformable grip can be tubular or somewhat cylindrical in shape. The grip can have a long axis and a diameter. The diameter may vary along the long axis of the grip in a manner similar to that of the cross-section of the barrel of the writing implement discussed above. However, the cross-section of the deformable grip may be different than that of the barrel. Typical hand-held writing devices include a deformable grip that has a thickness of from about 0.05 mm to about 4 mm or from about 0.1 mm to about 2 mm. The provided deformable grip can also include physical features on its outer surface— the surface that is being held. For example, the outer surface of the deformable grip can include physical features that enhance hand gripping. Examples of these types of features include any physical relief pattern such as grooves, dots, surface texturing, microfeatures, nanofeatures, or any other physical feature that allows for an enhanced grip. The physical features on the outer surface of the provided deformable grips can be molded into the grip, abraded away into the grip, or added to the grip such as, for example, skid-free adhesive patches. Any other surface modification of the outer surface of the provided deformable grip that enhances gripping is within the scope of this disclosure. The provided hand-held writing device and method also can include a viscoelastic polymer for the grip. The relatively high frequency of writing strokes (generally in the 10 Hz to 1 Hz range) doesn't allow for easy deformation of grip material during writing motions, while the relatively low frequency of overall gripping pressure (0.5 Hz to 0.01 Hz) allows for large deformations to occur, even with relatively low pressures. The elastic nature of the material allows it to recover to its original dimensions when not in use. The deformable grip includes a viscoelastic polymer that does not spontaneously deform at room temperature under the force of gravity. As is well known to those of ordinary skill in the art, polymers that have a useful structure can have a yield stress. The yield stress can be greater than any force which is applied intentionally or unintentionally to the polymer. The provided viscoelastic polymer has a yield stress greater than gravity at room temperature so that the polymer will does not spontaneously deform or flow under the force of gravity. E = E' + i E"
wherein E is Young's modulus which is a tensile modulus measured in tensile mode. Viscoelastic materials have different components of modulus at different temperatures or different frequencies. Typically, temperature and frequency are interrelated so that high frequency behavior is equivalent to low temperature behavior and low frequency behavior is equivalent to high temperature behavior. This phenomenon, known as time-temperature superposition is well known to persons having ordinary skill in the art. Thus, the temperature and/or frequency of measurement need to be specified. Useful viscoelastic materials for the provided deformable grip can be materials that have a high modulus (i.e., Young's modulus) at relatively high frequencies, such as those of writing strokes (i.e., 10 Hz to 1 Hz), so that they resist easy deformation. The high modulus at relatively high frequency can resist deformation during the writing process— thereby making the writing devices easy to use when writing. Typically, the viscoelastic material at 30°C can have a storage modulus at 10 Hz that is at least 50% greater than its storage modulus at 0.1 Hz. For example, the viscoelastic material can have a storage modulus, E', at 10 Hz of greater than about 40 MPa, greater than about 250 MPa, or even greater than about 600 MPa at 30°C. The viscoelastic material can have a storage modulus, E', at 0.1 Hz of greater than about 0.5 MPa and less than about 400 MPa, less than about 50 MPa, or even less than about 10 MPa at 30°C. The provided deformable grips can include a viscoelastic polymer that has a high loss component, E", relative to its storage component, E', at 30°C. This ratio is defined as tan δ. When a user is writing using a hand-held writing device, the movements of the fingers are transferred to the writing device. Writing strokes typically occur several times per second and are on the order of 10 Hz. It is desirable that significant deformation of the grip during the writing process does not occur. A large tan δ corresponds to significant time-dependence in the deformation, thus favoring deformation at low frequency while limiting deformation at high frequency. 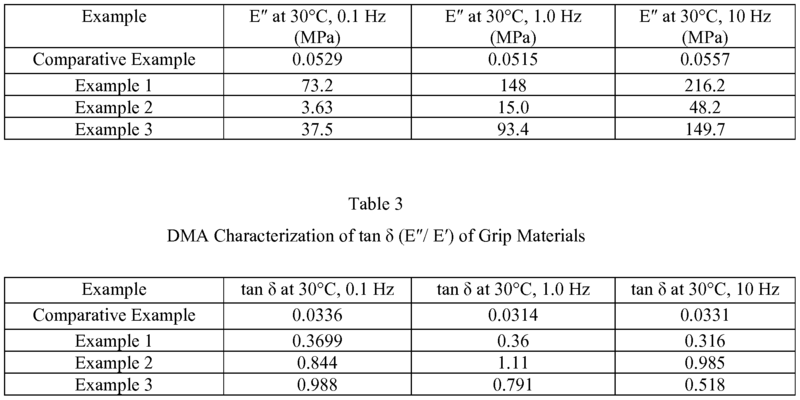 For example, the provided deformable grips can have a tan δ greater than about 0.3, greater than about 0.5, or even greater than about 0.8 at a temperature of 30°C and a frequency of 0.1 Hz. The deformable grip can include a viscoelastic polymer with a glass transition temperature near or above room temperature. The provided viscoelastic polymer can have elastic properties. Typically, polymers with elastic properties include crosslinks. The crosslinks can be either physical crosslinks or chemical crosslinks. Physical crosslinks can include polymers or polymer combinations that have phase domains, for example, hard and soft segmented polyurethanes, or block copolymers such as KRATON polymers. Additionally, physical crosslinks can also be by chain entanglements such as in high molecular weight polymer blends or interpenetrating networks as is known to those of ordinary skill in the art. In other cases, the polymer can be chemically crosslinked. These chemical crosslinks can often be covalent bonds. The chemical crosslinks can be formed as the polymer is initially cured, often by including a multifunctional monomer in the polymerization mixture. Alternatively, the chemical crosslinks can be formed after the initial polymerization, for example, by radiation such as UV light or E-beam. The intrinsic shape of chemically crosslinked polymers can be fixed as the crosslinks are formed, and this intrinsic shape of these chemically crosslinked polymers can usually not be changed even at extreme temperatures. Useful viscoelastic polymers may be physically and/or chemically crosslinked. Suitable physically crosslinked polymers include linear block copolymers such as thermoplastic polyurethane elastomers with hard segments and soft segments. Multiblock copolymers can also serve as viscoelastic polymers such as, for example, polyurethanes with polystyrene and poly(l,4- butadiene) blocks; ABA triblock copolymers of poly(tetrahydrofuran) and poly(2- methyl-2- oxazoline); polyhedral oligomeric silsesquioxane (POSS)-modified polynorbornene; and polyethylene/nylon-6 graft copolymers. Other examples of viscoelastic polymers include polyurethanes, polynorbornenes, polyethers, polyacrylates, polyamides, polysiloxanes, polyether amides, polyether esters, trans- polyisoprenes, polymethyl methacrylates, cross-linked trans-polyoctylenes, cross-linked polyethylenes, cross-linked polycyclooctenes, inorganic-organic hybrid polymers, copolymer blends with polyethylene and styrene-butadiene co-polymers, urethane-butadiene co-polymers, polycaprolactone, and oligocaprolactone copolymers. Examples of suitable chemically crosslinked viscoelastic polymers include, but are not limited to, crosslinked high density polyethylene, crosslinked low density polyethylene, and crosslinked copolymers of ethylene and vinyl acetate. Suitable viscoelastic polymers also include those described in U.S. Pat. Nos. 6,388,043 (Langer); 5,155,199 (Hayashi); 7, 173,096 (Mather et al. ); 4,436,858 (Klosiewicz); 6,423,421 (Banaszak); and U. S. Pat. Publ. Nos. 2005/244353 (Lendlein et al. ), 2007/009465 (Lendlein et al. ), and 2006/041089 (Mather et al.). Examples of commercially available thermoplastic viscoelastic polymers include: polyurethanes available under the trade designation DIARY, including the MM, MP, MS, and MB (microbead powder) type series available from SMP Technologies, Inc. of Tokyo, Japan. Other polymers that are useful in the provided deformable grip include thermoplastic polyurethanes as described herein, acrylic polymers such as the polymerization of isobornyl acrylate and isooctyl acrylate or 2-ethylhexyl acrylate. Also useful are the ring-opening metathesis polymerization (ROMP) product of dicyclopentadiene and 5-hexyl-2-norbornene. The ROMP polymerization is a well-known polymerization process that was first disclosed by R. H. Grubbs and W. Tumas, Science, 243, 4893 (1989) and is well-known to those of ordinary skill in the art of polymerizations. poly(norbornyl-POSS) copolymers", Polym. Int., 49, 453-457(2000); and A. Lendlein et al., "Shape-memory Polymers", Angew. Chem. Int. Ed., 41, 2034-2057(2002). Acrylic shape- memory polymers are disclosed in CM. Yakachi et al., in Advanced Functional Materials, 18, 2428-2435 (2008) and D.L. Safranski et al., in Polymer, 49, 4446-4455 (2008). Commercially available thermoplastic shape-memory polymers include, but are not limited to, polyacrylates such as the PMMA and JTbu series (PolymerExpert, Pessac, France), cycloaliphatic polyetherurethane Tecoflex (TFX) (Lubrizol Corp, Cleveland, OH), polyurethane foam of polyether polyol series- DIARY , including the MM type, MP type, MS type and MB (microbead powder) type series (Diaplex Co. Ltd., Tokyo, Japan)., or CALO-MER from the Polymer Technology Group (DSM PTG, Berkeley, CA). Other useful polymers are disclosed, for example, in U. S. Pat. Appl. No. 12/814,553 (Rule et al.) filed and U. S. S. N. 61/264,024 and 61/261,595 (both Rule et al.) both filed November 16, 2009. Also provided is a method of making a hand held writing device. The provided method includes providing a writing implement having at least one recessed section upon its surface and placing a deformable grip on the writing implement. The deformable grip surrounds at least one portion of the barrel of the writing implement forming an air gap between the grip and the barrel of the writing implement. The deformable grip includes a viscoelastic polymer having a glass transition temperature about room temperature or above. The writing device, grip, and polymers are described above. The deformable grip can be removable— that is it can be removed from the barrel of the writing implement and then replaced. Hand- held writing device 100 includes barrel 102 which is substantially cylindrical. In this embodiment, hand-held writing device is a ball-point pen with a retractable point. Hand-held writing device 100 includes deformable grip 104 that envelops a recessed section of barrel 102 of the ball-point pen thereby forming an air gap between the grip and the recessed section of the barrel of the writing implement (not shown in Fig. 1 but shown in Fig. 2A described below). Fig. 2A is a cross-sectional view of hand- held writing device 100 at the location of the base of the arrows shown in Fig. 1 and from the ball-point pen tip end as indicated. Fig 2A shows the same embodiment of hand- held writing device 100 in cross-section at a location where there is a recessed section of barrel 102 (not shown in Fig. 2A but shown in Figs 3A-3C) under deformable grip 104. Deformable grip 204A is shown as a cylinder concentric with recessed section 205 A of barrel 102 shown in this cross-sectional view. Deformable grip 204A is shown to envelop recessed section 205 A of barrel 102 thereby forming air gap 206A between deformable grip 204A and recessed section 205A of barrel 102 of hand-held writing device 100. Volume 201A provides space for additional components of the writing implement (not shown). Fig. 2B shows a cross-sectional view of a different embodiment of a provided hand-held writing device. In this embodiment, deformable grip 204B is shown to envelop recessed section 205B of the barrel of the writing device. As in Fig. 2A, volume 20 IB provides space for additional components of the writing implement. Ridges 207B are provided attached to deformable grip 204B and extending inward towards recessed section 205B of the barrel of the writing device. Ridges 207B form three air gaps 206B between deformable grip 204B and recessed section 205B of the barrel of the writing device. It is also contemplated that deformable grip 204B can be placed directly upon barrel of a writing implement 205B that has no recessed section. In this case, ridges 207B need to have a high enough modulus to hold deformable grip 204B up and away from barrel 205B of the writing implement. In other embodiments, ridges 207 B can be oriented parallel to the barrel of the writing implement, orthogonal to the direction of the barrel of the writing implement or any angle in between. Additionally, ridges 207B can run the full length of the deformable grip or be tabs in any geometrical orientation so that an air gap is created between the deformable grip and the barrel of the writing implement. Additionally, it is possible that ridges 207B can be molded into the barrel of the writing implement and that the deformable grip can be substantially cylindrical and fit over them also forming an air gap. Fig. 2C shows a cross-sectional view of another embodiment of a provided hand-held writing device. In this embodiment, the air gap 206C between deformable grip 204C and recessed section 205C of the barrel of the writing implement is divided into three sections. Recessed section 205C is in the shape of a curved triangular prism and is oriented so that the points or junctures 208C of the prism contact deformable grip 204C of the writing device. As in Fig. 2A, volume 201 C provides space for additional components of the writing implement. Figs. 3A-3C are side view illustrations of the embodiment shown in Fig. 1 in various modes of deformation. Fig 3A shows barrel 302 of writing device 100 and includes recessed section 305 of barrel 302 enveloped by deformable grip 304. Deformable grip 304 forms air gap 306 between recessed section 305 of barrel 302 and itself. Fig. 3B shows the same embodiment shown in Fig. 3 A where the top portion of deformable grip 304 has been deformed by a user gripping the pen between, for example, a thumb on the bottom and one or more fingers on the top. Gripping (and releasing) of writing device 100 usually is on the order of several seconds so the frequency associated with this deformation is on the order of 0.1 Hz. In the illustrated embodiment, relatively easy deformation at a frequency of 0.1 Hz is desirable. Fig. 3C shows the same embodiment shown in Fig. 3 A except in this illustration the user is pushing the pen through writing strokes using movement of fingers on the pen tip. Writing strokes typically occur several times per second with a frequency of about 10 Hz. Thus, it is desirable that the grip not be easily deformed at 10 Hz. In Fig. 3C, the grip 304 shows an undesirable deformation in which, during a downward writing stroke, the grip moves closer to only one side of the barrel 302 within the space formerly occupied by the air gap 306 formed in the recessed section 305. In contrast, by resisting deformation at a frequency of 10 Hz, such undesirable deformations can be avoided. A Q800 Dynamic Mechanical Analyzer (available from TA Instruments, New Castle, DE) was used in tensile mode. Strips of materials were cut into strips 6.2 mm wide using a die cutter. The strips were mounted in tensile grips with a test length between 15 mm and 21 mm. The samples were tested with amplitude fixed at 15 μηι and frequencies of 0.1, 0.32, 1.0, 3.2, and 10.0 Hz. The test temperatures were incremented in 2.5°C steps through the test range of 0°C to 60°C. A piece of masking tape (SCOTCH 232, available from 3M, St. Paul, MN) 19 mm wide was wrapped around one end of a pencil until the outside of the tape layers had a diameter of 10 mm. The pencil (Staples Inc., Framingham, MA) had a hexagonal cross-section with a distance of 7.1 mm between opposite sides. The grip was mounted onto the tape surface with a 5 mm overlap between the tubing and the tape such that the remaining portion of the grip had a gap between the inside of the grip and the pencil shaft. After equilibrating overnight in an atmosphere of 23°C and 50% relative humidity, the pencil was grasped, and the time for the inside of the grip to contact the pencil shaft was recorded. The pencil was then released, and the time for the grip deformation to relax back to cylindrical shape was recorded. Pentaerythritol tetrakis(3,5-di-tert-butyl-4-hydroxyhydrocinnamate) (0.20 g, Sigma- Aldrich, St. Louis, MO) was dissolved in a solution of dicyclopentadiene (8.0 g, TCI America) and 5-hexyl-2-norbornene (12.0 g). A portion of this solution (2 g) was put in a glass vial with an inside diameter of 13 mm and a height of 40 mm. A solution of First Generation Grubbs Catalyst (0.006 g, Sigma-Aldrich) in toluene (0.1 1 g, EMD Chemicals, Inc., Gibbstown, NJ) was added and the vial was capped. The vial was then laid on its side and rolled on a roller mill for 1 minute, during which time it coated the walls of the vial and cured. The vial was broken to remove the hollow, cylindrical polymer sample. The sample was then postcured for 10 minutes in a 100°C oven. The sample was trimmed to a tubular shape 32 mm long, and it had a wall thickness of 1.4 mm. In the grip response test, the sample gradually deformed over 1 second until it contacted the pencil shaft. When released, the grip gradually recovered its circular shape over the course of 20 seconds. A sheet of the polymer of the same formulation was prepared with the same cure conditions. This sheet was analyzed by DMA. Fig. 4A is a graph of Young's modulus (E' vs Temp (°C)) of a DMA of the material in Example 1. Selected data points are displayed in Table 1. Instruments, Inc., South Hackensack, NJ). The resulting polymer was pressed into sheets in a hydraulic press at 290°F (Model 2699 from Carver Inc., Wabash, IN). The sheets were then cut into smaller pieces nominally 1 cm x 2 cm. These polymer pieces were then loaded into an injection molding press to form cylindrical pen grips. The grips were injection molded using custom fabricated aluminum molds on a Morgan- Press Injection Molder, Model G-100T, using the following conditions. The resulting grip was trimmed to 35 mm long. In the grip response test, the grip deformed gradually over the course of 4 seconds until it contacted the pencil shaft. When released, the grip gradually recovered its initial, circular shape over the course of 50 seconds. A sheet of the same polymer formulation was analyzed by DMA. The DMA graph is displayed in Fig. 4B with selected data points tabulated in Table 1. With the thermoplastic polyurethane of Example 3, the modulus at 10 Hz is several times higher than the modulus at ~0.1 Hz over most of the range of interest. This viscoelastic nature of DiARY MM 3520 makes it a particularly suitable component of formulations for pen grips. Various modifications and alterations to this invention will become apparent to those skilled in the art without departing from the scope and spirit of this invention. It should be understood that this invention is not intended to be unduly limited by the illustrative embodiments and examples set forth herein and that such examples and embodiments are presented by way of example only with the scope of the invention intended to be limited only by the claims set forth herein as follows. All references cited in this disclosure are herein incorporated by reference in their entirety. Following are exemplary embodiments of a hand-held writing device according to aspects of the present invention. Embodiment 3 is a hand-held writing device according to embodiment 1 , wherein the air gap between the grip and the barrel of the writing device is from about 0.2 mm to about 2.0 mm. Embodiment 4 is a hand-held writing device according to embodiment 1 , wherein the hand-held writing implement is selected from a pen, a pencil, a stylus, a wax crayon, and a marker. Embodiment 5 is a hand-held writing device according to embodiment 1 , wherein the deformable grip completely envelops the barrel. Embodiment 6 is a hand-held writing device according to embodiment 5, whereby the deformable grip is substantially tubular. Embodiment 7 is a hand-held writing device according to embodiment 1 , wherein the viscoelastic material at 30°C has a tensile storage modulus at 10 Hz that is at least 50% greater than its tensile storage modulus at 0.1 Hz. Embodiment 8 is a hand-held writing device according to embodiment 1 , wherein the deformable grip has a thickness of from about 0.05 mm to about 4 mm. polymerization product of isobornyl acrylate and isooctyl acrylate. Embodiment 10 is a hand-held writing device according to embodiment 1, wherein the deformable grip comprises the ring-opening metathesis polymerization product of dicyclopentadiene and 5- hexyl-2-norbornene. Embodiment 1 1 is a hand-held writing device according to embodiment 1 , further comprising at least one recessed section upon the surface of the barrel. Embodiment 12 is a method of making a hand-held writing device comprising: providing a writing implement comprising a barrel; and placing a deformable grip on the writing implement so that the deformable grip surrounds at least a portion of the barrel of the writing implement forming an air gap between the grip and the barrel of the writing implement, wherein the deformable grip comprises a viscoelastic polymer that does not spontaneously deform at room temperature, and wherein the viscoelastic polymer, when deformed, recovers its initial shape at room temperature in from about 5 seconds to about 5 minutes. Embodiment 13 is a method of making a hand-held writing device according to embodiment 12, wherein the hand-held writing implement is selected from a pen, a pencil, a crayon, a stylus, and a marker. Embodiment 14 is a method of making a hand-held writing device according to embodiment 12, wherein the air gap between the grip and the barrel of the writing implement is from about 0.2 mm to about 2.0 mm. Embodiment 15 is a method of making a hand-held writing device according to embodiment 12, wherein the viscoelastic material at 30°C has a storage modulus at 10 Hz that is at least 50% greater than its storage modulus at 0.1 Hz. Embodiment 16 is a method of making a hand-held writing device according to embodiment 12, wherein the deformable grip has a thickness of from about 0.05 mm to about 4 mm. Embodiment 17 is a method of making a hand-held writing device according to embodiment 12, wherein the deformable grip comprises a thermoplastic polyurethane or an acrylate polymer including the polymerization product of isobornyl acrylate and isooctyl acrylate. Embodiment 18 is a method of making a hand-held writing device according to embodiment 12, wherein the deformable grip comprises the ring-opening metathesis polymerization product of dicyclopentadiene and 5-hexyl-2-norbornene. Embodiment 19 is a method of making a hand-held writing device according to embodiment 12, further comprising removing the deformable grip from the barrel of the writing implement and, optionally, replacing the deformable grip on the writing implement. Although specific embodiments have been illustrated and described herein for purposes of description of the preferred embodiment, it will be appreciated by those of ordinary skill in the art that a wide variety of alternate and/or equivalent implementations calculated to achieve the same purposes may be substituted for the specific embodiments shown and described without departing from the scope of the present invention. Those with skill in the mechanical, electro-mechanical, and electrical arts will readily appreciate that the present invention may be implemented in a very wide variety of embodiments. This application is intended to cover any adoptions or variations of the preferred embodiments discussed herein. Therefore, it is manifestly intended that this invention be limited only by the claims and the equivalents thereof. wherein the viscoelastic polymer, when deformed, recovers its initial shape at room temperature in from about 5 seconds to about 5 minutes. 3. A hand-held writing device according to claim 1, wherein the air gap between the grip and the barrel of the writing device is from about 0.2 mm to about 2.0 mm. 4. A hand-held writing device according to claim 1, wherein the hand- held writing implement is selected from a pen, a pencil, a stylus, a wax crayon, and a marker. 5. A hand-held writing device according to claim 1, wherein the deformable grip completely envelops the barrel. 6. A hand-held writing device according to claim 5, whereby the deformable grip is substantially tubular. 7. A hand-held writing device according to claim 1, wherein the viscoelastic material at 30°C has a tensile storage modulus at 10 Hz that is at least 50% greater than its tensile storage modulus at 0.1 Hz. 8. A hand-held writing device according to claim 1, wherein the deformable grip has a thickness of from about 0.05 mm to about 4 mm. 9. A hand-held writing device according to claim 1, wherein the deformable grip comprises a thermoplastic polyurethane or an acrylate polymer that includes the polymerization product of isobornyl acrylate and isooctyl acrylate. 10. A hand- held writing device according to claim 1, wherein the deformable grip comprises the ring-opening metathesis polymerization product of dicyclopentadiene and 5-hexyl-2- norbornene. 1 1. A hand- held writing device according to claim 1 , further comprising at least one recessed section upon the surface of the barrel. 13. A method of making a hand- held writing device according to claim 12, wherein the handheld writing implement is selected from a pen, a pencil, a crayon, a stylus, and a marker. 14. A method of making a hand-held writing device according to claim 12, wherein the air gap between the grip and the barrel of the writing implement is from about 0.2 mm to about 2.0 mm. 15. A method of making a hand-held writing device according to claim 12, wherein the viscoelastic material at 30°C has a storage modulus at 10 Hz that is at least 50% greater than its storage modulus at 0.1 Hz. 16. A method of making a hand-held writing device according to claim 12, wherein the deformable grip has a thickness of from about 0.05 mm to about 4 mm. 17. A method of making a hand-held writing device according to claim 12, wherein the deformable grip comprises a thermoplastic polyurethane or an acrylate polymer including the polymerization product of isobornyl acrylate and isooctyl acrylate. 19. A method of making a hand- held writing device according to claim 12, further comprising removing the deformable grip from the barrel of the writing implement and, optionally, replacing the deformable grip on the writing implement.